American’s call it the French Riviera. But the French name, Cote D’Azur, which translates to Coast of Azure, paints a much more vivid image. This picturesque coastline travels along the Mediterranean Sea from Cassis to the French and Italian border. From the inland fields of lavender and sunflowers to the dramatic beauty of the sea, Côte D’Azur has long been a muse to the most famous artists including Matisse, Monet, Renoir, and Cézanne. The magnificence of the south of France also beckons the world’s royalty, celebrities, and wealthy. 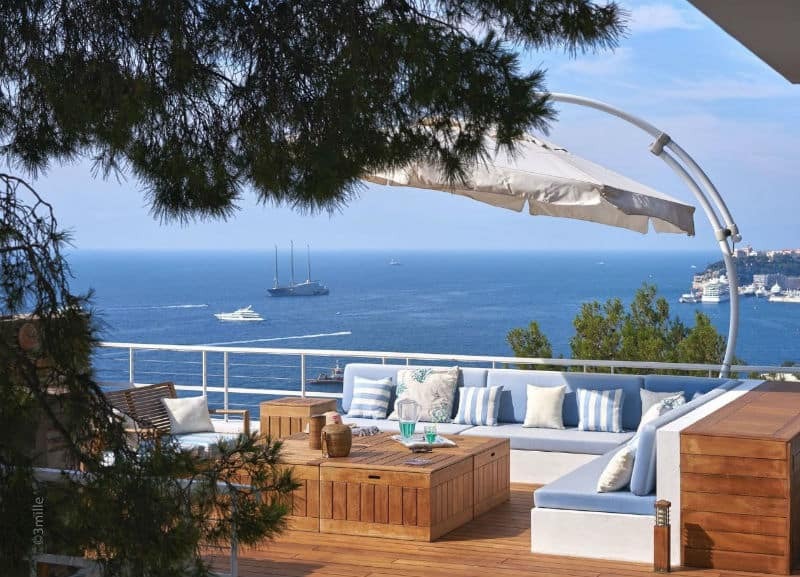 As such, Côte D’Azur is home to a luxury unsurpassed anywhere else in the world. 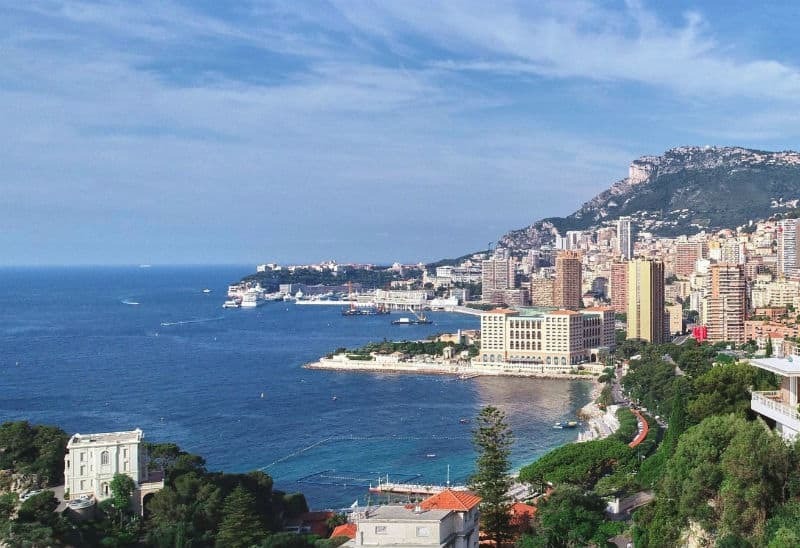 One glance into Port Hercules in Monaco will give an indication of the wealth and luxury found in the small country nestled into the French coastline. Superyachts costing upwards of $300 million often fill the harbor. Notably, every September, Monaco hosts a luxury yacht show. In addition, the upscale casinos of Monaco are famous throughout the world. These lavish casinos have an air of elite sophistication quite unlike the mega casinos so prevalent in the United States. In fact, some of these exclusive casinos even require an invitation. Roquebrune-Cap-Martin is near the eastern tip of Côte D’Azur. The coastal community is widely considered a suburb of Monaco. Many villages can be found in the region. One of the most interesting is the medieval village of Roquebrune which sits atop Mont Angel. The charming village is filled with boutiques and delightful cafes. Additionally, the town is home to a 10th century castle and The Church of Saint-Marguerite, built in the 12th century. 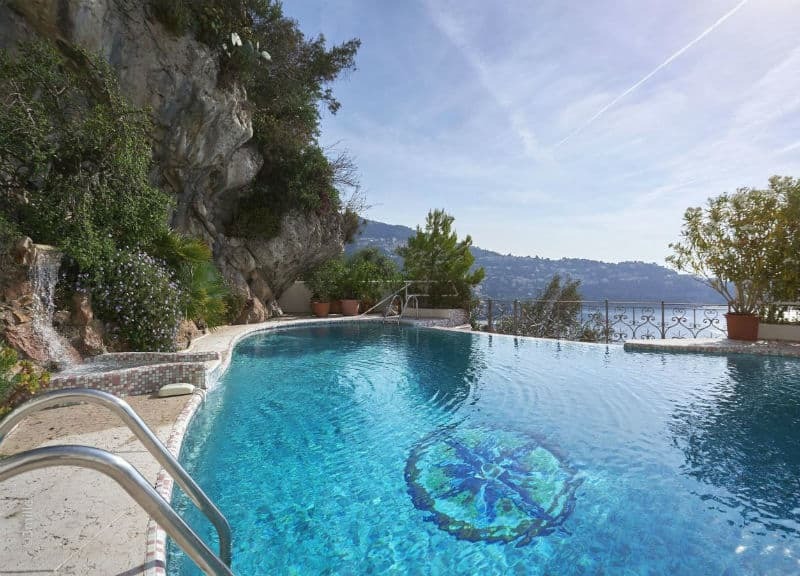 This luxury property is west of Roquebrune-Cap-Martin and east of Monaco. In fact, Monaco is just a short walk away. 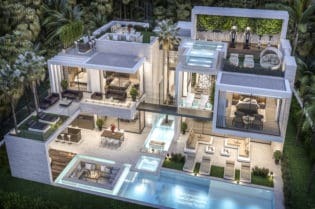 This luxury real estate has a prestigious French address in the secure gates of Monaco neighborhood. The half acre property sits perched upon a hillside that travels up from the deep blue waters of the Mediterranean, with views of Cap-Martin and Monaco. Both of the villas on this property offer beautiful, unimpeded views of the sea. 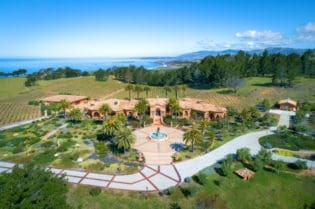 The main villa is nearly 6000 square feet and the secondary villa is over 2000 square feet. Combined, this property has nine bedrooms. The spacious 1400 square foot master floor is in the main home. In addition, four of the bedrooms include ensuite baths. A sauna, jacuzzi, wine cellar, and surveillance system round out this home’s amenities. Furthermore, a separate apartment is also available for staff. This magnificent home brilliantly intermingles with nature. The outdoor, heated pool nestles against the hillside, providing complete privacy. 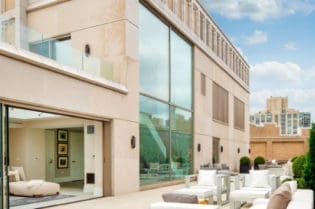 Each floor of the home has a terrace. Mature trees grow in and around the extensive wooden terraces, creating charming nooks to sit and enjoy the view. 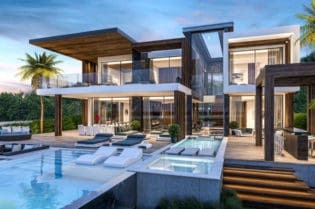 Uniquely, the shape of the home, terraces, and pool gently curve to mimic the topography of the hill. It has different decks (terraces) for a global surface of 1.021sq.m. It looks like you are on a boat. 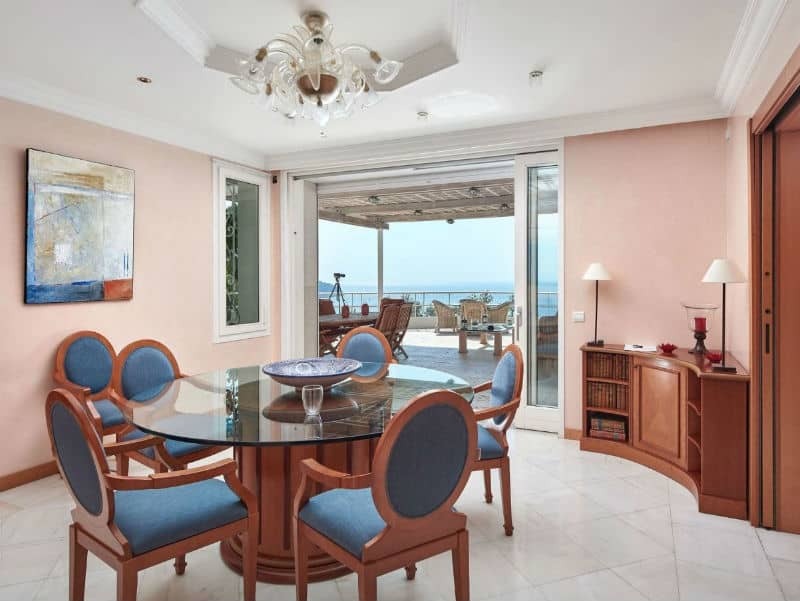 Whether you are looking for a seaside holiday home, a main residence, or a savvy real estate investment, search no further than this dream home in Roquebrune-Cap-Martin. Indulge in the luxury that is Côte D’Azur. 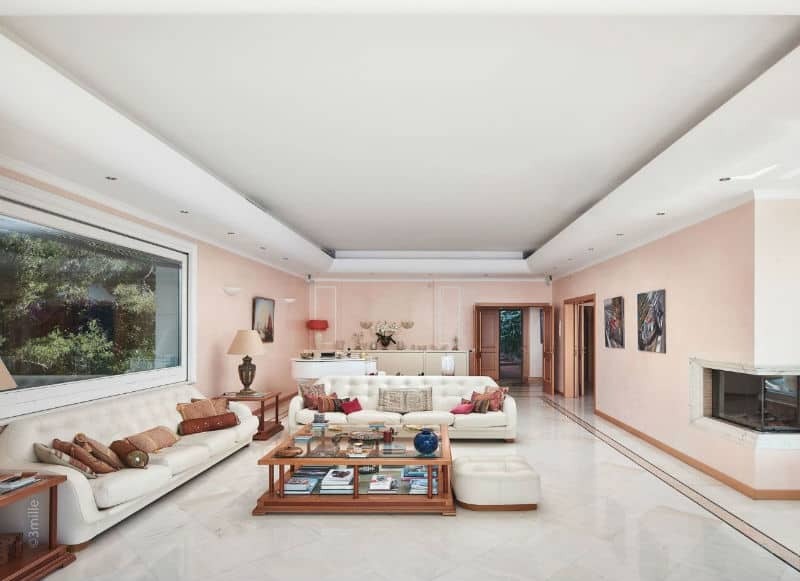 Côte D’Azur Sotheby’s International Realty lists this dream home with an asking price of €24.900.000.00, approximately $29,098,099.16. Kristina Kyrland is an East Coast girl at heart. 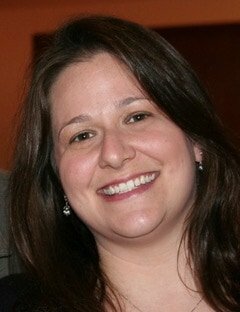 She has always had an affinity for the glamorous and opulent lifestyle of southern California. When she’s not writing, she can be found traveling to new destinations with her family or exploring different ways to create peace in her home.